Little Common Football Club has clinched promotion with six league games to spare. The Commoners made sure of a top three finish in Macron Store Southern Combination League Division One with a 2-0 win at home to Wick on Saturday. Adam Smith closes down Wick attacking player Alex Kew. Goals at the end of either half from man of the match Wes Tate and Jamie Crone gave Common a 24th victory in 28 league encounters so far this season. On a day when only one other fixture in the division went ahead, Common got the job done in a scrappy contest against a fourth-placed Wick side which triumphed by the same score in October’s reverse fixture. There wasn’t a great deal between the sides during the first half, although Common carved out almost all of the goalscoring opportunities, at times with a bit of help from their opponents. They almost broke through in the 15th minute when Lewis Hole was denied by outrushing Wick goalkeeper Keelan Belcher as he tried to poke the ball past him and Adam Smith’s follow-up from outside the box was well headed off the line by Charlie Northeast. The fit-again Sam Winter keeps a close eye on the Wick player in possession. The visiting number one smartly pushed aside Tate’s sweetly-struck half-volley at his near post and Sam Winter headed over from a Tate corner. 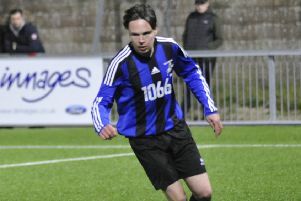 At the other end, Russell Eldridge made a timely intervention as Alex Kew bore down on goal from a Wick counter-attack. Hole was foiled by Belcher for a second time when played in by a delightful pass from Tate, but Common did find the net in the 45th minute. Although Eldridge’s ball over the top wouldn’t quite come down for Hole, the supporting Tate finished coolly into the corner of the net. Early in the second half Tate’s shot as the ball bounced up following a lovely pass from Hole was saved by Belcher. Common struggled to retain possession for much of the half, though, and Wick began to pose a greater attacking threat. Wes Tate, scorer of Little Common's first goal, challenges Wick forward Josh Irish. Ashley Hawkes fired into the side-netting from the right-hand side of Common’s area after the ball broke kindly for him and just after the hour home goalkeeper Matt Cruttwell produced a great save from Kew following a lovely throughball by Josh Irish. Kew rolled the ball across the face of goal on one occasion and later fired just wide of the far post after cutting in onto his left foot. In between times, Tate went narrowly wide with a 25-yard curler and substitute Sam Ellis had a shot beaten out by Belcher diving to his right. Common wrapped up the points with a second goal in the 90th minute. Ellis found Crone, who shifted the ball onto his right foot and fired into the top corner via the underside of the crossbar. An Irish chip landed on the roof of Common’s net in added time as Common completed a third consecutive 2-0 victory. Common finished second last season, but were denied promotion due to their own ground at Little Common Rec not meeting the grading requirements for the Premier Division - or Division One for that matter. They put in place a groundshare arrangement with Premier Division side Eastbourne United AFC for this season, which will continue next term, so they will be promoted to the Premier Division for 2018/19. Common: Cruttwell, Paul, Walker (Maynard 81), Ward, Parsons, Eldridge, Tate, Winter (Ellis 72), Hole, Crone, Smith. Sub not used: Collier. Southern Combination League Division One top half (played-points): 1 LITTLE COMMON 28-73 (+67 goal difference), 2 Langney Wanderers 27-63 (+54), 3 Lingfield 27-58 (+44), 4 Wick 27-50 (+30), 5 BEXHILL UNITED 28-49 (+25), 6 Ringmer 27-48 (+18), 7 Mile Oak 27-44 (+7), 8 Selsey 25-40 (+9), 9 Hailsham Town 25-38 (+1).